Click the "Reminder" tab in the Task Editor window. 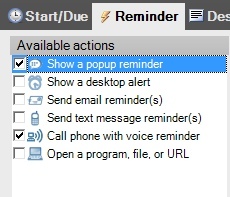 A list of available reminder types is shown on the Reminder tab of the Task Editor window. Reminders can be enabled or disabled using the associated checkbox.